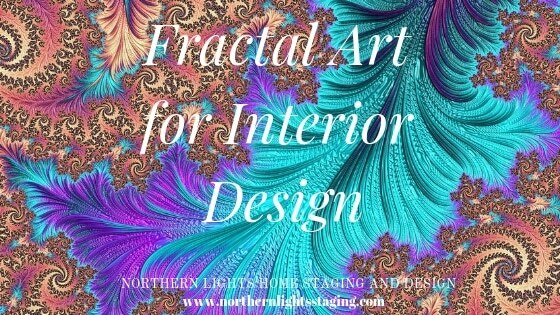 I recently discovered an art form called fractal art and love working with it to create beautiful pieces that are perfect for your Interior Design project! I love working with the brilliant colors, textures and the incredible detail possible with Fractal art. So what is fractal art? I do not totally understand it myself. It is a form of algorithmic art created by calculating fractal objects which can create still and moving images. It is a form of computer or digital art developed in the 1980’s. Bottom line? It is abstract art created by math. Creating fractal art is like traveling through a kaleidoscope that has no beginning or end. When traveling, you find a place you want to stop and stay a while. While there, you can manipulate the color, texture, light, shine, spectrum, hue and other elements around you until you have created the perfect place, and then you save it as an image. Sometimes I go a little too far playing with the elements and I ruin what I have made but can not go back. So I feel lucky when I can capture the perfect image. 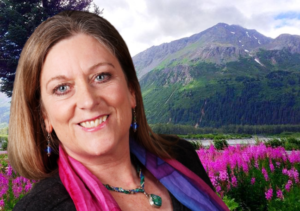 It is impossible to ever find that place again if I did want to replicate it…it would be like finding a single drop of water within the ocean. That is why each piece is one of a kind. Working with fractal art is a little like meditation and color therapy mixed together. As a person that totally loves color, I am in my happy place! 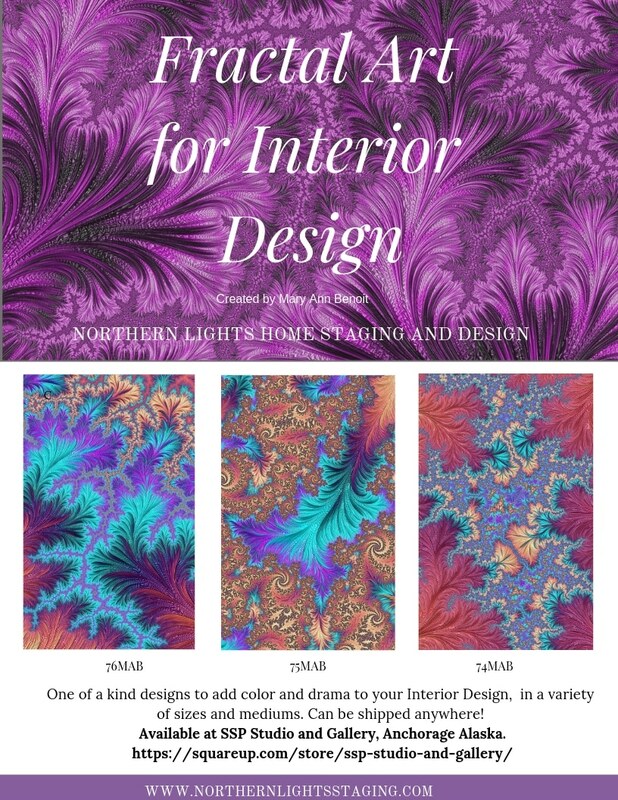 So how can you use fractal art in your home? 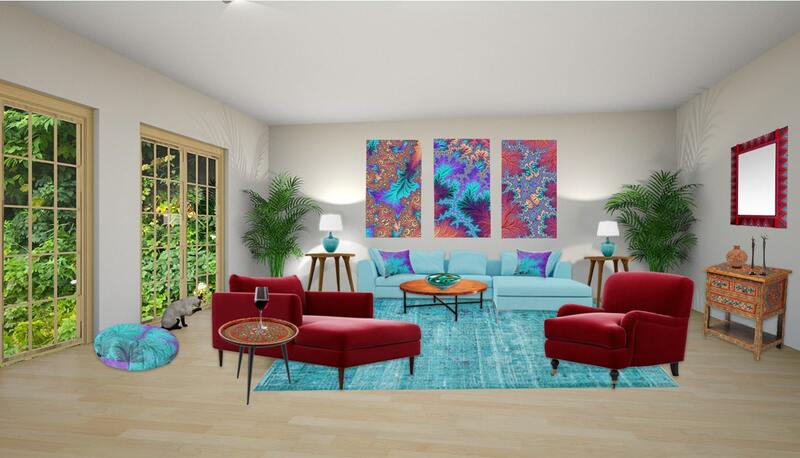 Here is an example of a Bohemian style living room that I created and Edesign for using fractal art for the wall art and pillows. I am honored that SSP Studio and Gallery in Anchorage reached out to me and loved my work and wanted to carry it in the gallery. The three pieces below are available for sale in a wide variety of sizes and mediums done with high quality printing that can be shipped worldwide. They have beautiful photography that has been modified using various effects to create unique and amazing pieces. 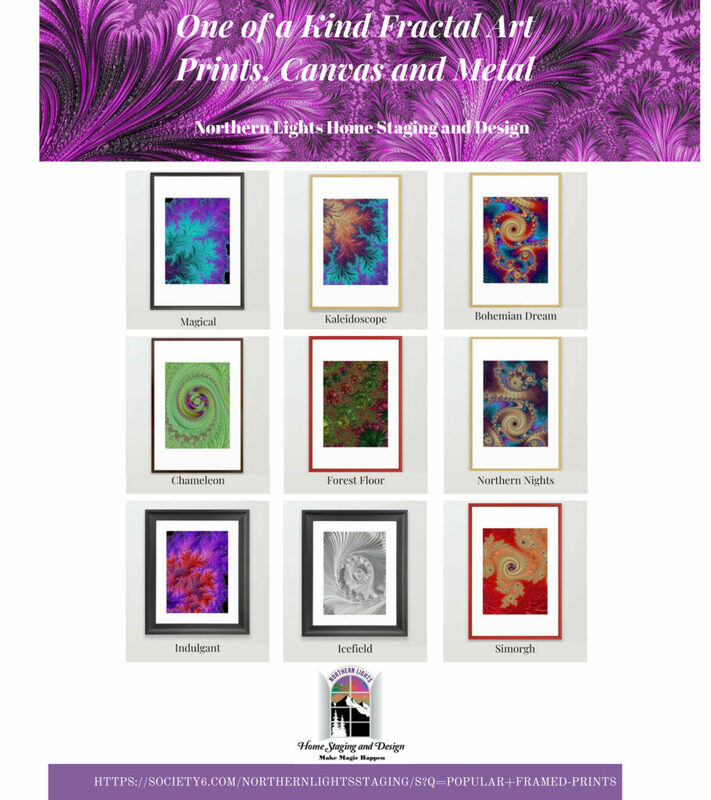 If you see other works that you like, use the code NLS5 at checkout to get a 5% discount. 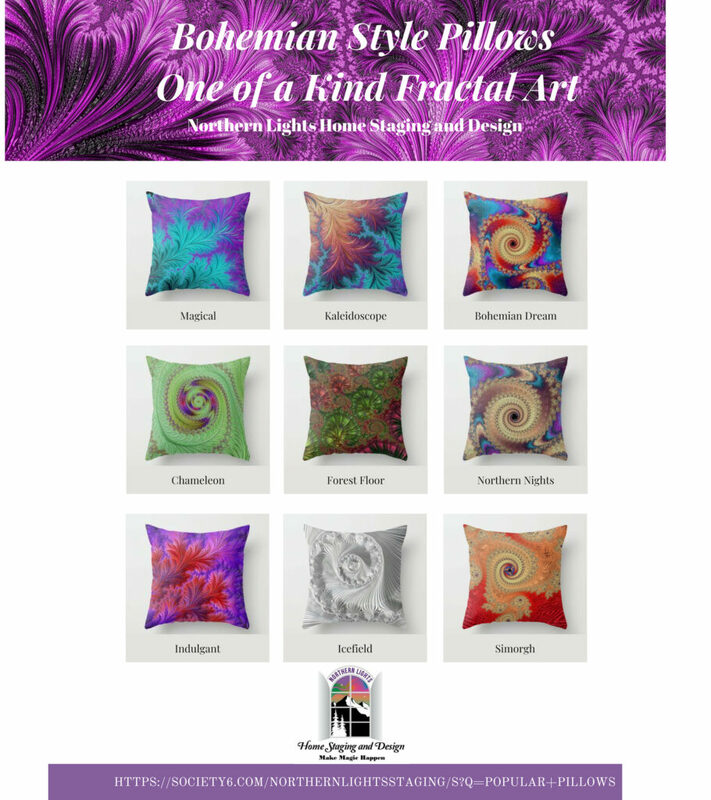 I have also opened an Artist Studio at Society 6, and you can get my fractal art on a variety of home decor products such as art, pillows and bedding, curtains, wall hangings and furniture. 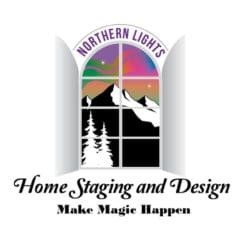 Stop by and visit and see if there is anything perfect for your home! Here are a few examples of some of the products available (not all are shown). 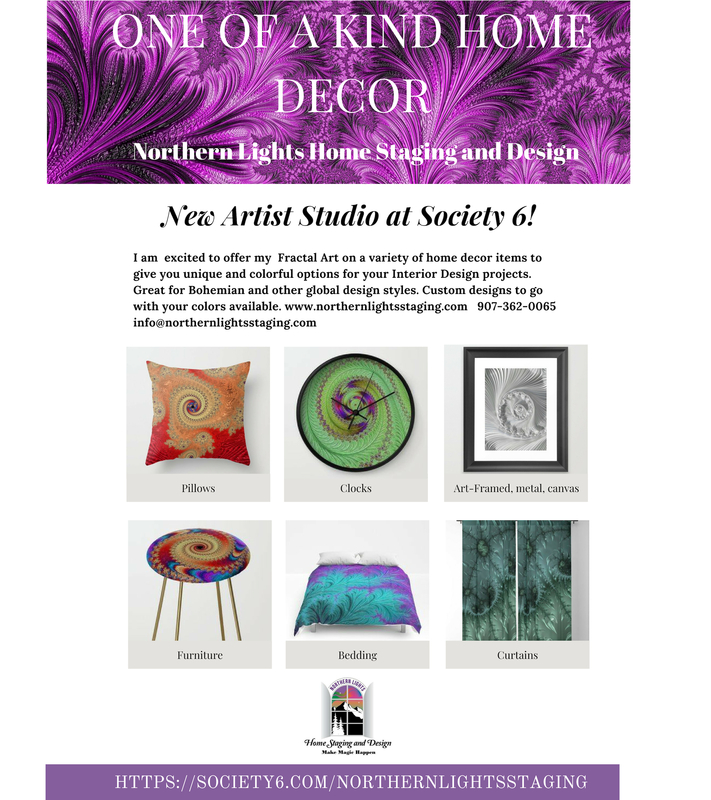 For more designs and products, stop by the studio. 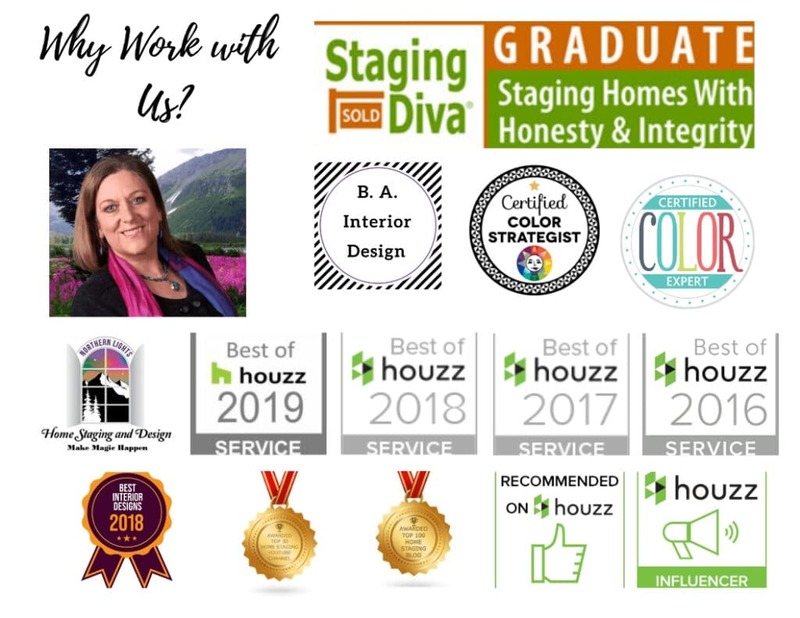 If you would like a custom piece for your Interior Design project, contact me and I can design something just for you.